Are you interested in viewing icebergs up close and personal rather than standing on the coastline? 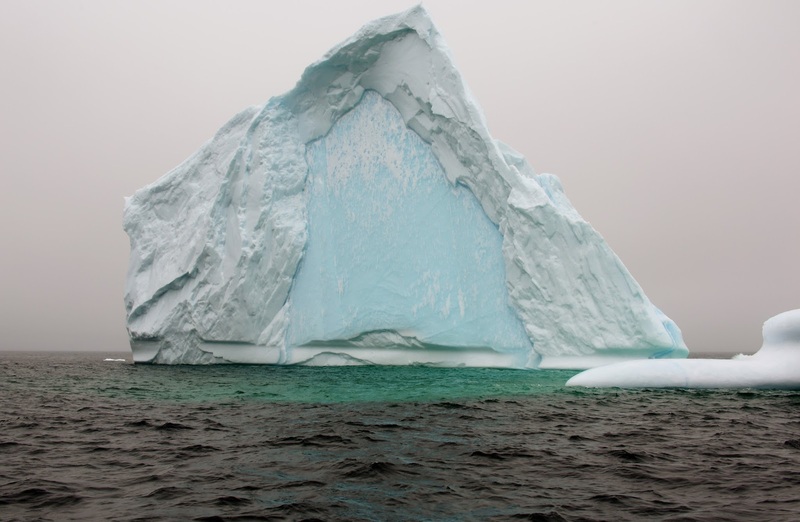 Are you interested in feeling the cold air of these massive icebergs as they drift through our Newfoundland waters? If you have answered yes to the questions above, Newfoundland is for you! Newfoundland is your place of choice to view these massive icebergs. Trinity Eco-Tours will give you an unforgettable holiday that includes scenery, wildlife, culture and a great sense of adventure. I have lived here all my life and it still excites me to go on the water every trip not just every day but up to three times a day. As a matter of fact, we have been seeing whales and icebergs together for the past several years, how can you beat that? Many individuals think that to receive an unforgettable experience with Icebergs and Whales you would have to go to Alaska. Well, that is not the case. I have taken many guests from Alaska, on our Newfoundland iceberg tours, who have sung the accolades of Newfoundland for their iceberg/whale experience. Early in the spring, they may even have the opportunity to meet our favourite whale, Finnegan. Our iceberg tours are done out of Trinity Bay, Newfoundland. Trinity Bay is about as far away from Disneyland as you can get. On our iceberg tours and whale watching tours, you are one in a million instead of one of a million. When you view an iceberg from one of our Zodiacs, it is a breathtaking experience to be so close to the water looking up at a large pinnacled or drydock iceberg. Do not depend upon one area to fulfill all of your iceberg dreams. Book at least two or three different areas where icebergs are well known. For instance on the west coast of the province, St. Anthony is a great place to view icebergs later in the season. There has a tendency to be a high amount of pack ice early in the season, which may block the icebergs in. However, you should also consult other resources like IcebergFinder.com or the Iceberg Alley App. If you are on the Great Northern Peninsula then the North Central and Central Coast may have icebergs to follow. You may want to book in Change Islands/Twillingate area. If launching from the East Coast all along the Northeast Coast of the Avalon Peninsula can be a potential viewing area. St. John’s has several Whale Watch/Iceberg Tours. Therefore you may want to include Trinity/Bonavista as a jumpoff point for iceberg exploration. Weather can foil your exploration plans. If you only a lot one day in a particular place then fog or weather can prevent you from having your iceberg encounter before you have to move on. Take a two-pronged approach to your visit; early in the season be flexible in your travel plans and be ready to move on to another place on short notice! Traveling on a whim is hard for some travelers but early in the season, you may be able to negotiate better rates and take advantage of the shoulder season when there is lots of space and availability. An added benefit is that you can also be on a tour that is very small and personal like Bonnie and Shelley below. Get the information upfront. Follow the Iceberg Finder website that identifies icebergs with pictures on google maps. You can get dates of sightings, pictures of the iceberg and the route to follow to get there. Another great resource is the Iceberg Alley App. It also gives sightings, pictures, and locations of icebergs, whales, and wildlife. Download it on your phone and have access while you travel to the latest pictures and locations to find the icebergs you are after. 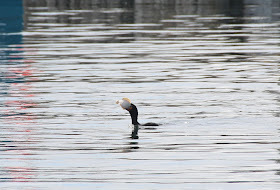 We also post daily photos and videos in season showing our icebergs, whales, seabirds and wildlife to our Facebook page. Sometimes we have drone footage and other interesting events like Finnegan the Friendly Humpback whale, who we met during an iceberg tour in 2016. CBC wrote an interesting article on Finnegan! Liking our Facebook page will provide you with up to date information about what is available in the Trinity area. We also supply information to IcebergFinder.com and Iceberg Alley App. Another great resource is a private facebook page Newfoundland Iceberg Reports. They never let a Newfoundland Iceberg slip them by! Go on multiple tours! It may be a good idea to do more than one tour. Make sure you get the best of the season and go to visit the different areas where icebergs are. Afterall you made the effort to get here so you should maximize success, experience, and fun. To sum up, this post, be informed!! Be like a mud flap – flexible and willing to travel! Your experiences will be ones to remember of Iceberg Season 2019! You may get to see the perfect iceberg on a perfect day. Be sure to check out our whale watching tours and sea kayaking tours if you are in the area and are looking for an experience that you won’t soon forget. If you would like any further information, send us an email bobbartlett@trinityeco-tours.com or call direct (709) 464-3712. I would be happy to help. I have traveled to the south in The Dominican Republic and ventured offshore to the Silver Banks where the mothers bear the young. Seeing a newborn calf exploring its surroundings while some strange two-legged creature swims around for an unknown purpose to him. There is magic in that. There is magic in listening and filming an inverted Humpback singer calling out his lonely call to others. I have filmed a sleeping Humpback in the northern waters of Trinity Bay my home and the base for our tours. Don’t watch all the way to the end as it is not exciting to watch someone sleep!! We have thousands of pictures, videos and personal experiences to share from our nine consecutive years on the water. So yeah I am going to say I am an expert! Plus we have been kissed by a whale and I have the video to prove it. Don’t worry Finnegan I am not the kind to kiss and tell, well maybe in your case. Growing up in the province I have traveled almost everywhere you could possibly go, experience, swim, dive, walk and film of this island we call home. I love this place there is no place I would rather be. You know how you tell all the Newfoundlanders in heaven? They are the ones that still want to go home!!!!! I will say the Northeast Avalon is among the best if not the best for whale watching. With a combination of spawning Capelin which draws the whales. the Fin, Humpback and Minke whales that migrate to feed on them. Combined with the fact that we get such splendid icebergs, Puffins, Northern Gannets, Cormorants, Bald Eagles, spectacular seascapes and caves Best Whale Watching yeah we do that!!! Well we have the most to see that I know of in just one tour. We have the videos. pictures and testimonials to prove it. If you can find better viewing from videos taken on anyone’s whale tours in Newfoundland I would be very surprised so I think I will throw my hat in the ring for BEST WHALE WATCHING TOUR IN NEWFOUNDLAND!!! My advice is when you want to find out something that is the best ask someone local and check out Newfoundland Labrador.com NewfoundlandLabrador.com!! All their providers are Tourism Assurance Plan certified as accommodations, tour, and guest services fully qualified and competent to give you your best experience. Everyone has great experiences on their visit here. It is something magical about the place we call home, Newfoundland. Well, let Skipper Bob talk about it a bit. A Newfoundland Whale Watching Tour is a beautiful, exciting, and unique experience. Your journey in Newfoundland will be chocked full of epic landscapes, endless wildlife viewing opportunities, and friendly encounters with humble locals. Newfoundland is also very large. If you have limited time during your vacation, you’ll want to prioritize all the wonderful things to see and do in this place. If you’re unconvinced, read on! If you happen to be in Newfoundland during whale season, you’re in for a treat.During a Newfoundland whale watching tour season, The largest population of humpback whales come here every year, feeding on krill and capelin. Spend some time along the coast (especially in Eastern Newfoundland), and you’re pretty much guaranteed to see a spouting or breaching humpback whale. 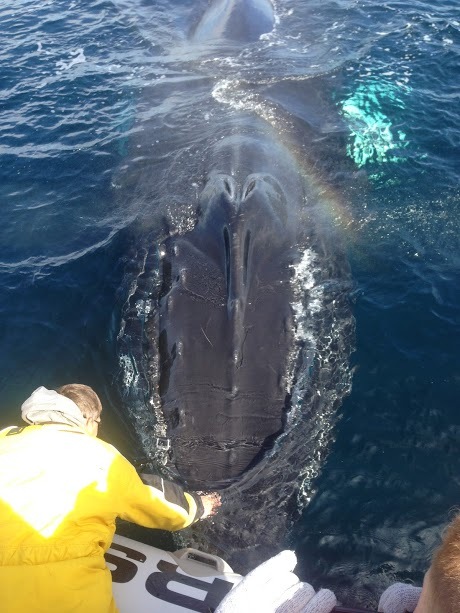 Your chances improve once you move further west from St. John’s, where you don’t have to compete with dozens of other people in the province’s capital for the best views on a whale watching Newfoundland boat. Maybe we’re biased, but we think the best opportunity to see whales is by taking a tour from Trinity! The best thing about a Newfoundland whale watching tour in a small, intimate boat is how easy it is to get up close and personal with a giant 40-ton humpback (or a minke, or even an orca). Whether you’re kayaking around Trinity Bay or zipping along in a Zodiac, it’s so much easier to get close to these friendly giants when you’re eye level with them from a smaller boat. You’re probably planning on coming here for humpback whales, minke, orcas, sperm whales, and even blue whales. But even on the off-chance that you won’t see any of those behemoth creatures, you’ll still have so many great opportunities to interact with other wildlife. You’re guaranteed to have an incredible experience on the water. 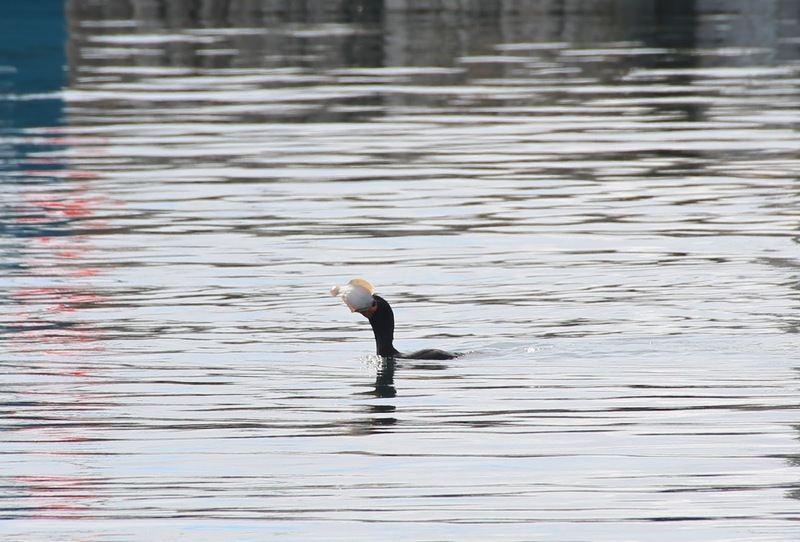 It’s not uncommon to see puffins diving for fish, or bald eagles circling overhead. You might have dolphins trailing behind you, or gannets swooping around your boat. It’s a rare day in Newfoundland when you don’t encounter wildlife! Take it from a Newfoundlander: there’s nothing like being out on the open waters of the Atlantic Ocean. Drink in the experience — the smell of briney water, the sun beating down on your head, and the sound of seabirds calling overhead. We make our tours as informative and entertaining as possible, so you’ll learn plenty about your surroundings as you’re cruising along. Newfoundlanders are notoriously fantastic storytellers, and you’ll come away from the tour with some new friends and a few insights into the local culture. 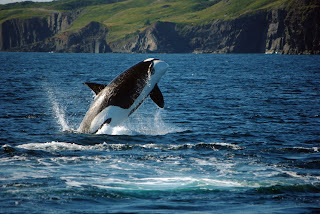 Newfoundland Whale Watching season is the best time to visit! 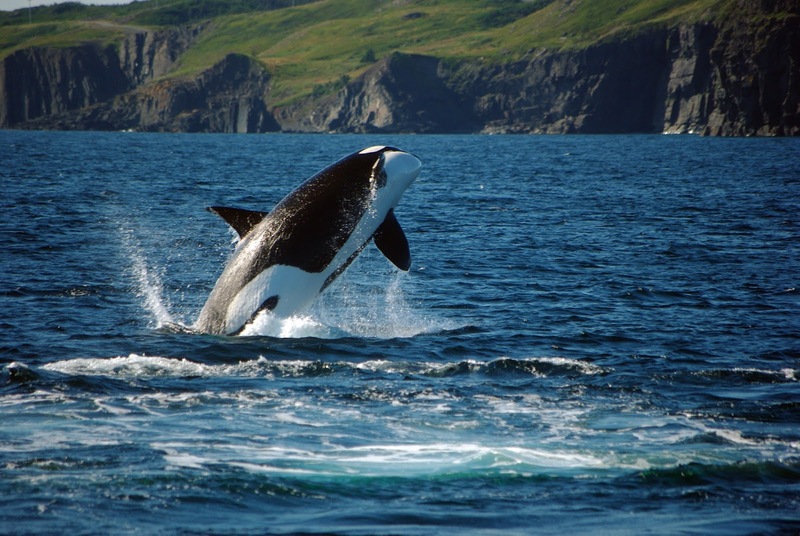 Most whales migrate to Newfoundland from May to September, which just so happens to be the best time to visit. The weather is mostly favorable during this time, and you can pair your whale watching trip with other memorable experiences — including iceberg viewing! Icebergs usually start making their way down Iceberg Alley from Greenland in March or April. Newfoundlanders (and visitors to the island) make the most of those glorious spring and summer months. There’s plenty of opportunity for hiking, sightseeing, and enjoying live entertainment and festivals. In the Trinity area, you can hike the Skerwink Trail, enjoy delicious meals at local restaurants (try the paninis at the Two Whales Coffee Shop), or catch some live music or theatre (especially at the Rising Tide Theatre). 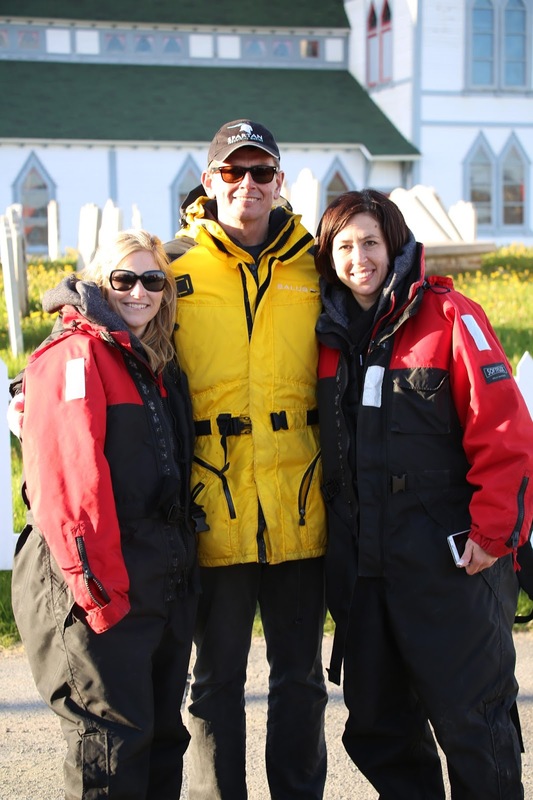 Join us on tour this year, and you’ll see for yourself why whale watching should be on your Newfoundland bucket list. That is right being on the water does not give you that high up and distant feeling away from the subjects you came to be close to. When you leave a zodiac tour that has had interactions with whales and wildlife there is a greater sense of awe and personal satisfaction. Why? Because you were in the thick of it! Instead of being one of 50 on a big boat you are one of no more than 11 people aboard our boats so we do get to ask you where you are from, what your highlights of the trip are so far (hoping ours is going to be it after today!!! ), We also recommend events or sites that you should see in our area and indeed across the rest of the island. Instead of being ferried around by someone you don’t see or meet, talk and ask your skipper exactly what you expect to see, discuss any feature of the tour or places. Talk about the safety features of our Rigid Hull Inflatables with him and be confident that your safety and comfort are our first priorities! That’s right be at water level and smell the ocean, it is a wonderfully intoxicating and liberating experience. Unlike whale breath which you will also get close enough to smell but you won’t notice that as the proximity to a whale is more awe inspiring!! Sitting in a neoprene immersion suit all warm and toasty as opposed to be on the deck of a large vessel in a windbreaker because you forgot to pack something warmer… common. On our tours we all need to watch for whales. We keep a 360 degree vigil and it is a team effort from before we even leave the dock. For that three hours you meet wonderful people also on our tours, share a fabulous experience and maybe even exchange photos with us and your fellow fun seekers!! Wonderful warm group in our suits sharing the love, Sweet Whale Love!!!! You are a lot more likely to get closer to whales in a Rigid Hull Inflatable Boat (Zodiac)than a big boat. Whales have to look out for the big boats because if they get too close they can hurt them with the props or the keel. We maneuver our boats out of their way and let them be socially interactive if they choose. Trying to get some good shots? Well Zodiac Whale/Iceberg/Bird Watching is the way to go! Be close on the water and be ready when the whales are close as opposed to being on a deck 10 to 12 feet above the water. Try not to get any whale spray on that lens!! I have been a passenger on tour boats in the Dominican Republic trying to study whales. Frankly here in the cooler waters of Newfoundland there is a level of whale activity I have never experienced anywhere including swimming with whales. The whales are gorging themselves on feed here for the long winter ahead. That means they are busy and when they are full and happy they are also quite active. Breaching whales, tail lobbing, spy hopping and peduncle throws are fairly common experiences here. See our Facebook page for our daily feed and past pictures. Look up our YouTube channel to see some of the underwater footage we got his year including lunge feeding Humpbacks, Beluga, Orcas and lots of other stuff. Look up our Facebook page too!! Already did our tour, write a review for us on Google for Trinity Eco-tours Lodge and come back and see us soon. Reduce Your Carbon Footprint: The effects of climate change are not only threatening the livelihood of animals on land, they also threaten the life of those in the sea. Being conscious of your resource consumption is not only important for you, but also for the ocean and its creatures. Conscious Consumption: It is inevitable that some of our food and resources come from the ocean, but they do not have to be procured using unsustainable practices. Educate yourself to avoid buying products that adversely affect marine life. Enjoy It Responsibly: If you love the ocean, you probably like going to the beach and being out on the water. When participating in such activities, clean up after yourself, and be sure not to introduce foreign substances or dangers to the habitat. Want to get out to the ocean to enjoy all of its beautiful wonders? We can introduce you to ocean wildlife responsibly and respectfully.